Sailthru has built an integration with Google’s AdWords Customer Match to enable clients to leverage the power of their Sailthru customer data across the Google AdWords platform. Using Sailthru’s Audience Builder, you can send custom-tailored sets of your user base (e.g. high-value users who have not engaged with email) to Google, creating Customer Match Audiences for retargeting across YouTube, Gmail, and Search. You can also find new customers across YouTube and Gmail who are similar to your highest-value users through Google Similar Audiences. Using the Customer Match Integration with Prediction Manager and Audience Builder, you can identify high-value customers and maximize your ad spend while attracting, acquiring, and retaining qualified leads for your business. Show ads to high-value users who have not engaged with email. Target new customers similar to your highest-value users with Similar Audiences. Measure the downstream impact of your Google advertising campaigns by measuring predicted CLV of customers acquired, easily viewable in Retention Analytics. Target customers that have opted out of email with an ad across the Google network. You need to have an existing Google Adwords account to use the integration. If you are interested in acquiring one, visit adwords.google.com and click Start Now. The Customer Match Integration requires whitelisting Sailthru to send lists to your Google AdWords Account using the Customer Match Uploader (CMU) API. You will need to work with your Google Account Manager to map your AdWords Advertiser ID (‘Destination ID’) to Sailthru’s Partner ID. Reach out to your Google Account Manager letting them know you would like to be whitelisted for the CMU API to map your AdWords Advertiser ID (‘Destination ID’) to the Sailthru Partner ID. On the Integrations settings page, next to Google Client Id, enter your AdWords account ID and click Save. You can send any existing Sailthru lists or create new lists for Customer Match. A smart list of users with a high Customer Lifetime Value in order to target similar audiences for acquisition with ads across Youtube or Gmail. A smart list of customers based on their Sailthru interests profile or purchased items, so you can target the right ads to the right users across Google AdWords. Your master list of all users, so that you can suppress them from new-user acquisition campaigns. A smart list of unengaged users, to suppress them from your retargeting ads, reducing your ad spend. You can create these lists using Audience Builder. Then, from the Lists page in My Sailthru, you can export these lists to Google. You can choose to create a new Google Customer Match Audience or add to an existing one. Note, however, that Google audiences created outside the Sailthru interface will not be available as a destination for your exports. You can also set your export to recur daily, automatically adding users to the audience who were not previously part of your Sailthru list. There is currently a limit of two recurring exports for your Sailthru account. 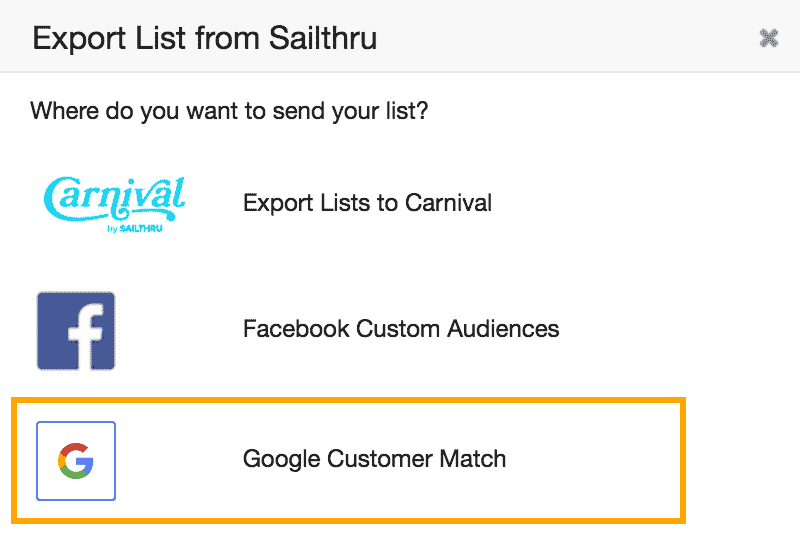 For each export to an existing list, whether manually initiated or part of a recurring export, users who are new to the selected Sailthru list are added, but no users are removed from the Google Customer Match list. For each resulting Customer Match audience that contains at least 5,000 users, Google also creates a corresponding Similar Audience in AdWords. For more information, see Similar Audiences. When you have a list that you are ready to send to Google, visit the Lists page in My Sailthru. Find the list you would like to export to Google, and click the cloud upload icon on its row. This process follows after you have selected a list to Export to Google, above. From the Audience dropdown, select Create new audience. Note: If no Sailthru-generated audiences yet exist, this will be your only option. Click Export. Your list is sent to Google and a new Customer Match is processed to generate the new audience. Please note, Google advises that it may take 24 hours for the new audience to be created. Access the Customer Match audience in Google AdWords. You can update an audience in Google any time after your have previously selected a list to export to Google using the instructions above. Note that for a given export, if you have set your Schedule to Recur daily, this additional export may not be necessary. From the Audience dropdown, select the name of the audience that you want to update. Only those audiences that you have previously created using a Sailthru export and have a Membership Status currently set to “Open” in Adwords are listed and available to update. The audience will retain all existing users, and any new users that were not included in previous exports will be added. Click Export. Your list is sent to Google, where Customer Match will add any newly identified users to your specified audience. Click the Accounts tab. Then, on the left-side menu, select Audiences. Your audience is listed in the table. Note that if you have just performed the Sailthru export, the audience will be listed, but the List size column may take some additional time to update (and will read “Processing” until the list size is available). Click the Campaigns tab, then, from the left-side menu, select Shared library. On the Audiences page, the audience is listed in the table. To view the list exports to Google or Facebook that you have previously set to recur daily, select the Partner Exports page within the Users menu. This will prevent future automated exports, but the audience will continue to exist in Google or Facebook. You may manually perform another export to the audience at any time. Similar Audiences are lists of customers that look similar to your existing customer base. AdWords looks at browsing activity on Display Network sites and uses this, along with their contextual engine, to understand the shared interests and characteristics of the people in your Customer Match Audience. You can use these audiences to acquire new customers who look similar to your existing customer base. Note: This 5,000-user minimum pertains to the number of users who exist in the audience after matching. For example, if you send a list of 6,000 users to Google, but only 4,000 are matched as Google users, the audience will not yet meet the minimum criteria for Similar Audience generation. You can target a similar audience the same way you’d target any other Google Audience: by adding it to an ad group in your campaign. When a similar audience is available, it will show the list size on each available network in your “Audiences” table. Once it’s active, you can add your similar audience list to your targeting. If a list says “Unavailable” in one of the columns, this means the list isn’t able to target on that property. Keep in mind: it may take up to 24 hours for your campaign to start serving. For more information on Customer Match and Similar Audiences, see the AdWords Customer Match documentation.